I’ve mentioned Sree Sreenivasan, the dean of student affairs for Columbia University’s Journalism School, a couple of times on this blog. Since he’s at the forefront of merging traditional journalism with digital journalism, I’d like to highlight an interview he did with Aliya S. King on Media Bistro. When it comes to technology, Sreenivasan considers himself both an evangelist and a skeptic. Although he doesn’t think it’s necessary to use each and every social networking site to be a successful online participant, one should at least be familiar and knowledgeable about them. I very rarely Tweet what I’m doing at the moment. I try to bring something into the conversation. No one wants to know who I am hanging out with or what I am eating — unless I can find a way to make it relevant to as wide an audience as possible. […] If I’m at a bar, I’m not Tweeting that. But if I’m at a bar offering a discount on the weekend or has a new recipe, I’ll Tweet about that, or the two-for-one drinks. I want my Tweets to be interesting/informative/relevant/timely/generous/fun or funny. […] Oh, and I never try to Tweet more than 120 characters, allowing people to easily retweet my stuff with comments. 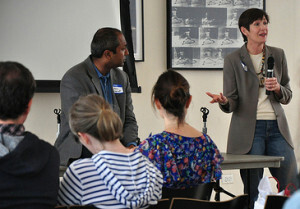 Image of Cyndi Stivers and Sree Sreenivasan by rasdourian, used under its Creative Commons license.